Percutaneous laser disc decompression (PLDD) is a type of surgery in which a laser probe is inserted into the intervertebral disc space and laser energy applied for achieving decompression and neuromodulation thereby relieving the pain. PLDD is a minimally invasive procedure that falls into the category of percutaneous intervertebral surgeries with the aim to significantly reduce the patient's pain and recover neurological deficit. It is performed under local anesthesia. By a specially designed laser, with a coefficient of absorbing energy adjusted for soft discus tissue, specific amount of heat is sent to achieve the evaporation of the water from the disc without additional thermal damage thus achieving decompression and creation of a stable intradiscal scar that will prevent herniation from reoccurring. Severe leg, arm, neck or lower back pain. Pain that has not responded to six weeks of conservative treatments- rest, meds or physical therapy. Herniated lumbar discs confirmed by x-ray studies that may include one or more of the following: Magnetic Resonance Imaging (MRI), CAT Scanning, Myelography, Discography. 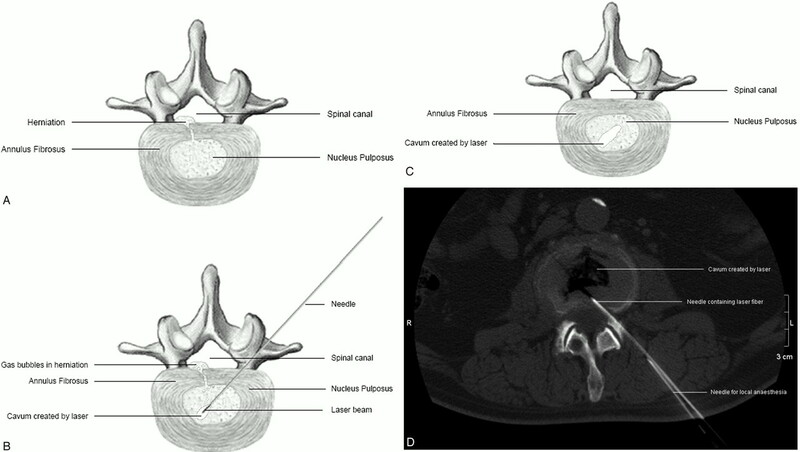 D, CT image after PLDD, showing a gas-containing cavum in the nucleus pulposus. Approved by the FDA and recognized by the AMA, PLDD is a minimally invasive laser treatment performed on an outpatient basis using only local anesthesia. During the procedure, a laser beam vaporizes a tiny portion of the disc, decompressing it. Patients typically get off the table and go home. There is no hospital stay, no long recovery period, and PLDD costs many thousands of dollars less than surgery. PLDD is the minimally-invasive medical procedure developed by Dr. Daniel S.J. Choy in 1986 that uses a laser beam to treat back and neck pain caused by a herniated disc. A herniated disc is like a balloon with a weak spot. Inflating it will cause a bulge (herniation). Pain results from the bulge pressing against nerves in the spinal column. The PLDD treatment is performed on an outpatient basis using only local anesthesia. During the procedure, a thin needle is inserted into the herniated disc under x-ray guidance. An optical fiber is inserted through the needle and laser energy is sent through the fiber, vaporizing a tiny portion of the disc nucleus. This creates a partial vacuum which draws the herniation away from the nerve root, thereby relieving the pain. The effect usually is immediate. Patients get off the table with just a small adhesive bandage and return home for 24 hours of bed rest. Then patients begin progressive ambulation, walking up to a mile. Most return to work in four to five days. Because only a thin needle is used, there is no cutting and no scarring. Since only a tiny amount of disc is vaporized, there is no subsequent spinal instability. PLDD is different from open lumbar disc surgery because there is no damage to the back muscle, no bone removal or large skin incision. Most of the complications that may occur with open surgery are eliminated with the PLDD procedure. Learn more about the professor and training.